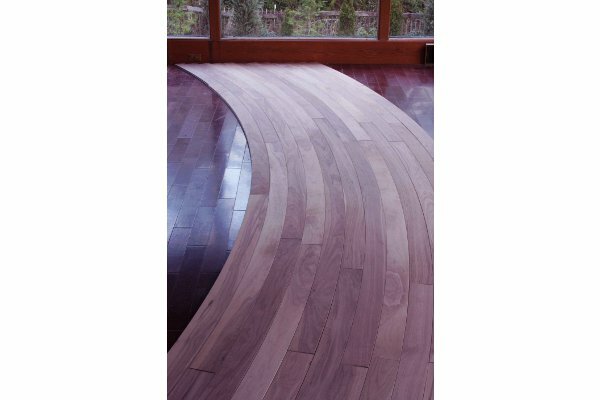 Curved Flooring from Pure Timber LLC is custom made for each application. The planks can flow and curve around obstacles like kitchen islands as if they were islands in a river. Species selection includes Walnut, Cherry, Red Oak, White Oak, Ash, and Maple. Producing flooring in this way is understandably difficult. In fact no one else in the world is able to do it. Pricing ~ $50/sq ft. Shown below are several rows of a Walnut project, staged for installation. 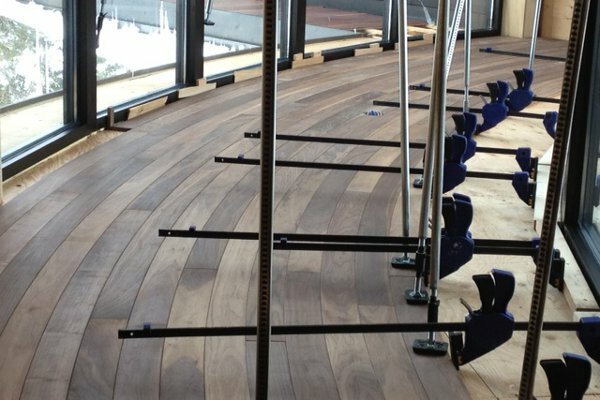 The curved planks are unfinished in these photographs. They are 4" face x 8' length. Flat sawn for this project, the curves can become much more dramatic when quarter sawn lumber is used. Produced by bending, not sawing Hardwood planks, reduces waste, and uses more of the board than could be used by sawing. CNC milled for tongue and groove. FSC hardwoods can be used by Pure Timber LLC in this radius flooring produced with their proprietary Compression Bending™ process.